The Philip S. Miller branch is blessed to have volunteer DJ on its volunteer crew. DJ began volunteering for Douglas County Libraries in June 2014. DJ is always happy to help with whatever is asked of her. 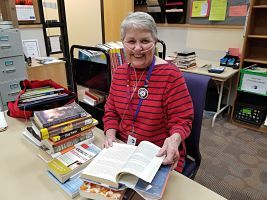 She does myriad projects to support library and book store operations as well as library events. If you attend an event at the Philip S. Miller branch it’s likely DJ has had a hand in preparing some aspect of it, or she is there welcoming you to the event, like she did at our Summer Reading Kickoff Party on her 4th anniversary of volunteering with DCL. She is a delight to all who meet her and we would be lost without her devoted volunteerism.